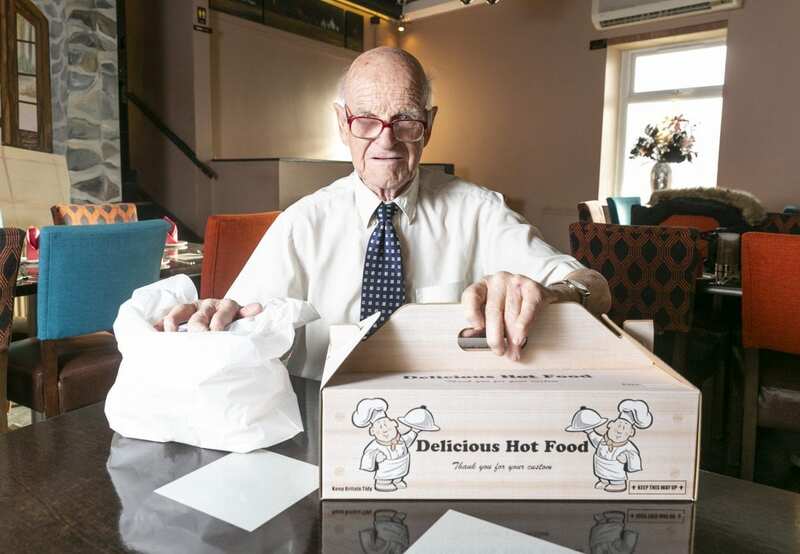 Dapper great-grandad Brian Loughans is believed to be Britain’s oldest takeaway driver – at the grand age of 82. Brian works on average 18 hours per week and hasn’t missed a single shift since he started the job around two-and-a-half-years-ago. 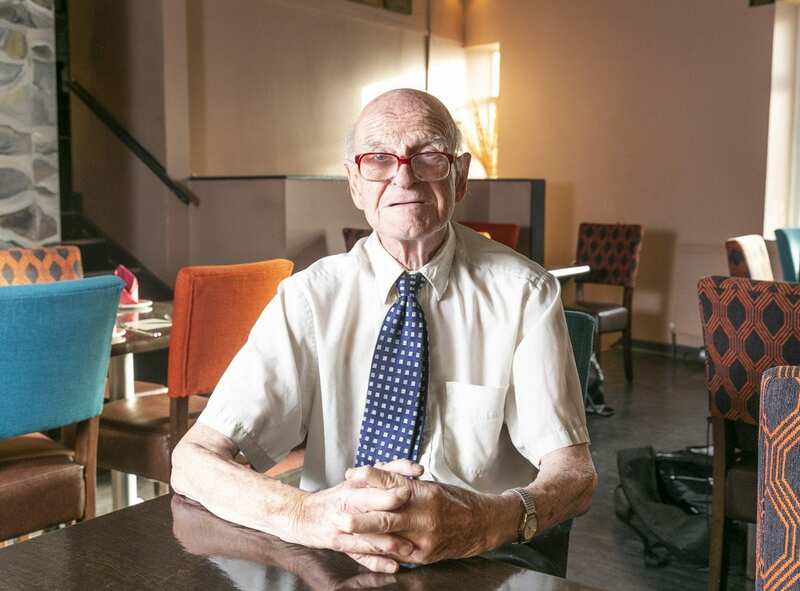 The RAF veteran and former cabbie delivers takeaways from the Indian restaurant in his Vauxhall Vectra in all weathers dressed smartly in shirt and tie – and without a SATNAV. He tends to cover the West Yorkshire area but 18 months found himself driving a staggering 112 miles down to West Bromwich for a regular customer. The widower, whose wife of 50-years Margaret, 69, died several years ago, has no plans to put his feet up anytime soon because the job keeps him busy. He actually started working for Kiplings restaurant in Sowerby Bridge, near Halifax, West Yorks., almost by chance. Brian was already known in the area for going door to door with Yellow Pages and the restaurant asked if he could deliver menus. One night when he popped in for some a driver had rung in sick so he was asked if he could deliver meals too, and the rest is history. 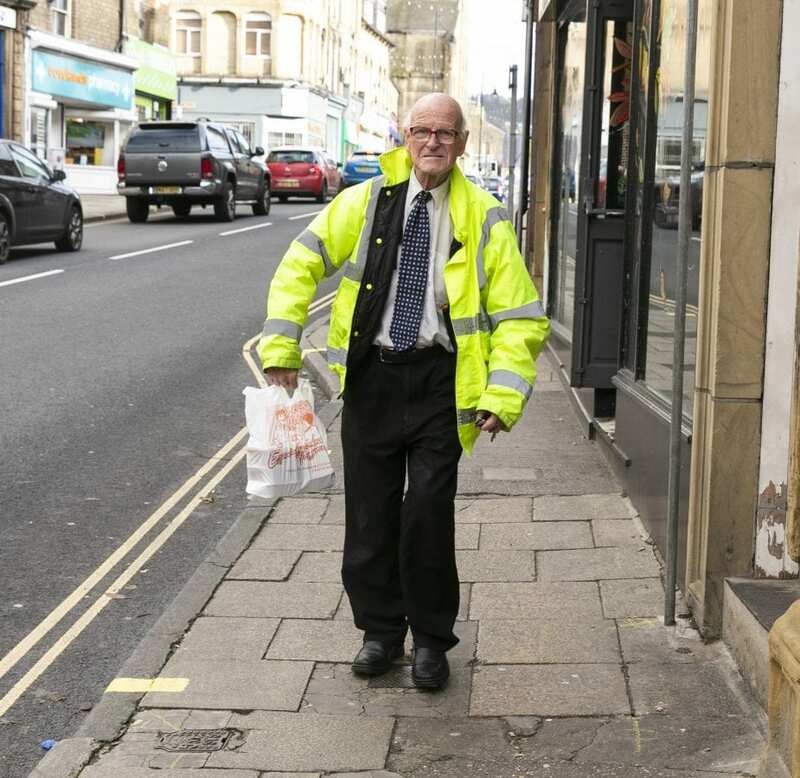 In recognition of his tireless work, Brian was recently voted the best takeaway delivery driver in Britain. Funnyman David Walliams presented him with the coveted gong in front of a star-studded audience at the British Takeaway Awards ceremony in London last week. The judging panel commended Brian for his punctuality, reliability and cheerful attitude. 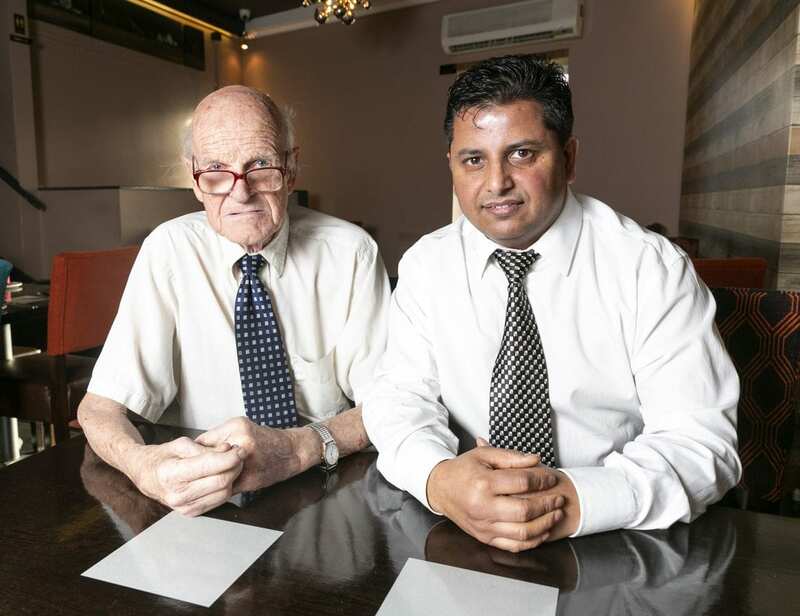 He said: “I believe I am probably the oldest person delivering Indian takeaways in the British Isles. “People have asked how I do it but according to the medics I am 100% fit.. I think the secret is not drinking or smoking. “It’s nice to have won but I don’t like having my name up in lights really, I’ve always been a little bit more quiet, I just do the things that need to be done. Dad-of-four Brian was a senior aircraftman with the RAF in the 1950s, serving as an air traffic controller during the volatile Suez Crisis. Later he worked as a TV engineer and then spent 40 years as a taxi driver – which taught him the streets of Halifax so well he doesn’t need a satnav. His only fear is dogs after being bitten by an Alsatian and a cocker spaniel while delivering Yellow Pages. During last winter’s big Beast from the East freeze Brian, who drives his own car, came across a woman stranded in the snow with her young daughter. Their car had broken down and their phone was dead so Brian gave them a lift home. It was only as he was dropping them off he discovered it was the same address he was delivering to. The husband was initially angry that his food had taken so long to arrive – until he realised Brian had brought his wife and child home safely. Brian works on average three or four shifts a week which can range from two to ten jobs per shift. 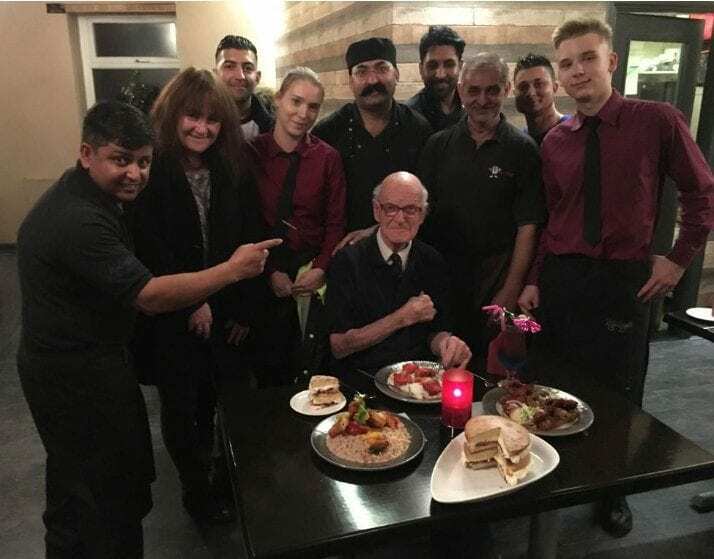 Kiplings boss Mohammed Rafiq, 52, said: “Brian is an absolutely wonderful employee and we’re very proud to have him working here. “The customers absolutely love him. He’s a bit of a celebrity around here. Brian is absolutely irreplaceable. It really is our honour. “We get him in at the prime times, the shifts vary. Sometimes he delivers two meals and sometimes he delivers 10. “Brian leaves an impression with the customer, he is not just an ordinary delivery driver. When Brian delivers you remember your delivery.